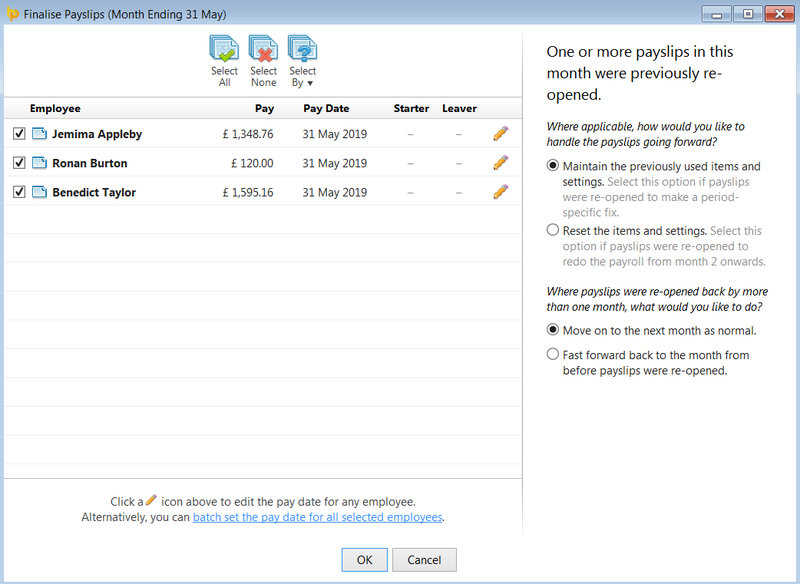 This utility allows you to re-open the last pay period finalised or re-open previously updated pay periods in order to amend pay details for one or more employees. On re-opening a pay period, original pay details for each employee will be retained by the software allowing the user to amend accordingly. 3) Select the employee(s) you wish to re-open payslips for. Fast forward back to the period from before payslips were re-opened. If, however, an FPS has been created but not yet submitted to HMRC, any amendments made to an employee's payslip will be automatically updated within the unsent FPS when the payslip is finalised again. If all employees' payslips are re-opened, the unsent FPS will be deleted altogether.